When I was a kid I used to make mud creations. I would work and work at making mud into perfect little m & m shaped discs. I would stretch up and put them along the edge of the roof of our shed so they would get optimum sun exposure. After a few days in the Arizona heat they would be hardened to a concrete like strength. This was the end of my creative process at the time. One would think I had some grand purpose for making these but, in fact, I just enjoyed making them. Looking back, I could have sold them to my brother for his ‘rock throwing’ practice or lined a path to my bedroom under the stairs (outside) or something like that. Instead, I usually took them down from the room, admired their hardness and smooth shape, and then throw them on the ground to try and break them. Kids. Yes, I was one too. My children also had a love for all things muddy. Many a time I would find them in the back yard digging a hole to make a pool. Inevitably, they would run out of steam before it was olympic size, and just end up filling it with water and then their bodies. Good clean fun is what I call it. They would play and play and then spend days digging the mud out from under their nails and the creases in their young skin. My back yard would end up looking like an obstacle course for dirt bikes, hills and valleys all over, but it was a reminder of the fun they had digging and mudding. I’ve never been a crazy clean house keeper. I like it clean, but I like it happy more. There were many times when those muddy feet that exited the mud hole made it all the way into the house across the nice clean carpet. I would gripe and moan but in the back of my mind I loved how the kids played together outside. Now my kids are older and they don’t play in the mud much at all. Part it may have to do with the fact that we don’t have any “dirt” in our yard anymore due to grass and gravel, but part of it may be due to the fact that they are growing older. 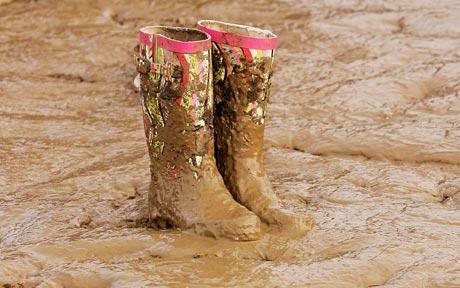 Now a days, the mud they get into is more of a metaphorical mud. They can get real messy at times due to the choices they make. Sometimes it is not so easy to clean that mud up either. As I sit and hold crying teens or listen to sad stories of choices regreted, I think back to the good old days of hosing off muddy kids. I didn’t know how good I had it then. My mom often says that she wishes she had enough money or time or power to take away some of the trials we, her kids, have had to go through. “If I had the money I would buy everyone a ____” It is a sweet thought and I appreciate my mom and her desires. I look at my kids and feel the same feelings at times. But then I step back just a bit and look again and see where their choices are taking them. Yes, sometimes it is down a road full of potholes, bumps, scrapes, and heartache, but at the end they are so much stronger. I had friends that didn’t let their kids play in the mud. They were horrified at the picture after picture of my kids smiling through the mud in my scrapbooks. Their kids would look at the pictures in wonder, like a child that had never been to Disneyland. I remember those clean kids, the ones that couldn’t handle it when they finally did get dirty. They thought it was the end of the world. They didn’t know how to clean up. Maybe its better to play in the mud and make stupid mistakes, so we will know how to clean up. I hope my kids are stronger because of the mistakes they have made and even the ones I have made. Nobody is perfect, but I think the path towards perfection is full of a lot of mistakes and lots and lots of mud…….cause I said so. This entry was posted in Beckie and tagged Arizona, backyard, children, consequences, creation, kids, learning, mistakes, mud, parenting, paths, roads, summer, sun. Bookmark the permalink. And this quote below is so full of wisdom I’m wondering how it wasn’t included in Proverbs!